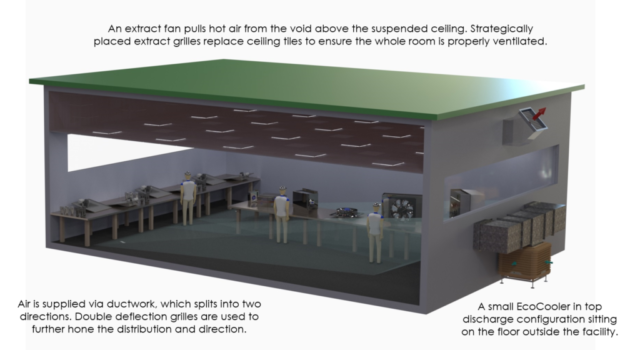 Many modern buildings require industrial cooling either for the comfort of the occupants or to protect the processes or equipment that they contain. There are three typical methods which can be employed to cool these buildings; ventilation, evaporative cooling or a refrigeration-based air conditioning system. The choice of system can have a dramatic effect on the total carbon emissions of the building and the energy consumed due to their different electrical demands. Ventilation systems can provide comfort cooling for most of the year. During prolonged periods of high temperatures, they are unable to maintain internal temperatures below 25°C. Refrigeration based systems are effective but can be expensive to operate and require frequent maintenance. 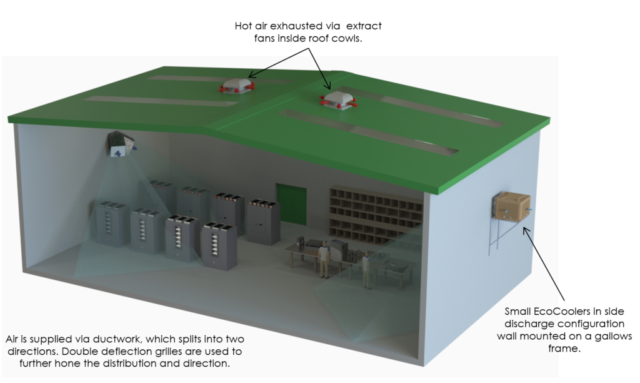 Evaporative cooling, which can produce air consistently below 22°C in the UK climate, provides an intermediate solution which consumes only a fraction of the electricity. 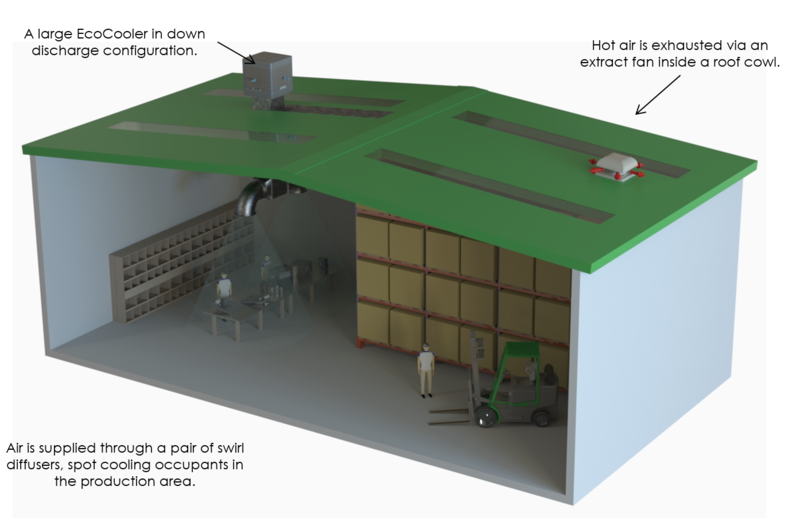 For more information please see our how evaporative cooling works page. EcoCoolings range of evaporative coolers delivers only 100% fresh air, at much lower costs than refrigerated cooling methods. Evaporative cooling is fast becoming the only viable option for cooling such large areas. An EcoCooling system uses up to 90% less energy and runs at less than 10% in comparison to refrigerated air con. Doors and windows can be left open, with absolutely no loss of cooling efficiency. If you need to cool small areas within a large space, then evaporative cooling gives you the only effective option which is spot cooling. 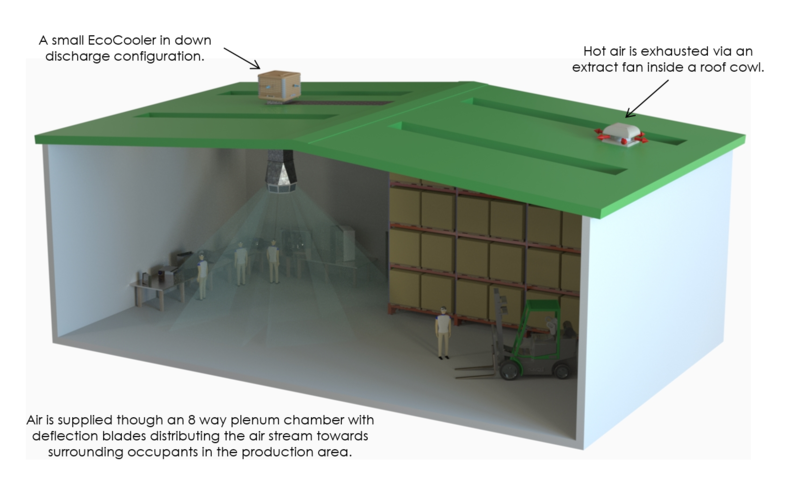 With spot cooling, an envelope of cool, high-velocity air can be directed to a specific area, irrespective of the surrounding conditioning. The evaporation process removes heat and produces a large continuous stream of comfortably cool, clean, fresh air. Step 2. Evaporative cooling operates during warm periods to cool external air. How many coolers do I need for my building? T o calculate how many coolers are required for an industrial cooling installation, the air change method can be used. The volume of the building is calculated and multiplied by a scaling factor dependent on the application, this gives the hourly flow rate required. Different air changes per hour are required for different applications. 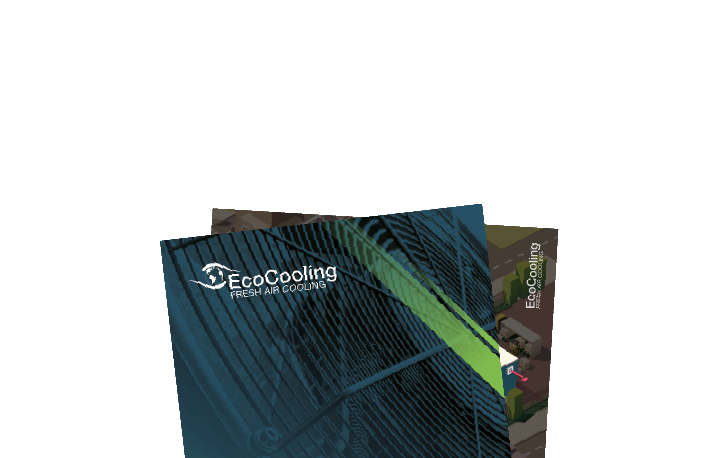 The EcoCooling range is the only evaporative cooler designed specifically for the UK and European industrial and commercial market. We have been in operation now for over 15 years and have more than 3500 installations in the UK, many of our clients have used us for several different applications. Our warehouse is based in Bury St Edmunds where we design and manufacture all of our products. We pride ourselves on our service to our clients and consider ourselves to be at the forefront of evaporative industrial cooling technology.